Godzilla Polish film poster (1957) | 'TAIN'T THE MEAT… IT'S THE HUMANITY! 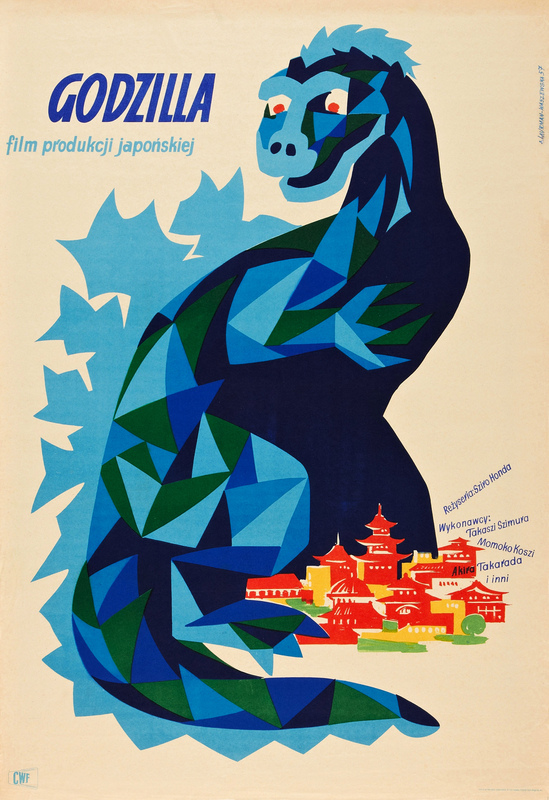 This charming movie poster for the Polish language release of Godzilla was created by graphic designer Alicja Laurman-Waszewska. Godzilla was directed by Ishirō Honda and released in 1954 where it quickly proved a huge success in both it’s native Japan, and all over the world. The story of the giant irradiated monster laying waste to Tokyo has spawned dozens of sequels, remakes and pastiches and Godzilla himself has become a movie icon. Unlike the Japanese film poster, which screams monster-disaster-movie, Laurman-Waszewska’s poster for the Polish language version is far more sedate and chilled. Emphasising Godzilla’s cuteness over his monstrosity she created a poster that is beautifully designed and eye-catching. Her use of contrasting colours – the cold blues and greens of the monster stand in bold relief against the warm reds and yellows of the village – worked wonderfully well. Granted, the image bears almost no relation to the film itself, but so what? I like her interpretation of the famous monster. As for the artist herself I can discover very little, apart from her date of birth (1920) and that she was a graduate of the Warsaw Academy of Fine Arts. She created a few other movie posters during her career of which this is hands-down my favourite.